We are steadily advancing fundamental numerical simulation technology and its peripheral technologies to the highest levels while ensuring greater usability, through encouraging its practical and effective application for space and aeronautic projects both within and outside JAXA. We are also improving the efficiency and reliability of numerical simulation technology in order to contribute to the development and enhanced credibility of the aerospace field. 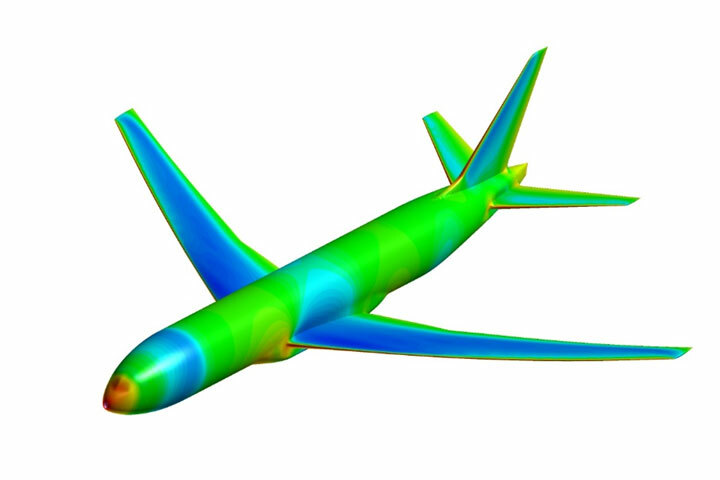 The objective of this study is to realize CFD that can be used in the entire flight envelope by investigating precise CFD technologies that can be applied to unsteady phenomena, such as aerodynamic buffeting and flow separation. 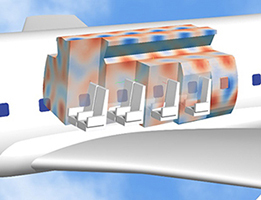 For diverse acoustic problems associated with aircraft and spacecraft, numerical technologies to predict sound sources, propagation, transmission, and vibration phenomena are common themes. We intend to upgrade these respective technologies to attain the world's most advanced and high speed levels, and to develop an integrative numerical prediction tool that accommodates the seamless application of technologies. 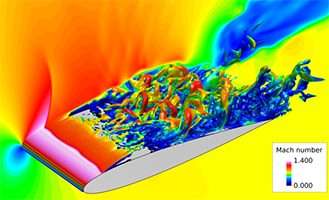 To quantitatively evaluate the environmental compatibility and stability of combustion, we are developing technologies that enable a highly accurate and time-dependent analysis of the combustor on a subscale level. This study aims at shortening the so far considerably long development term of electronic propulsion systems by developing an analysis tool in which the plasma flow inside the electronic propulsion system for space flight can be simulated, and through promoting an understanding of the flow field and numerical evaluation of its performance and durability via simulation. With the focus on improving work efficiency in various simulation scenes, we build user-friendly numerical simulation tools through enhancing the reliability of highly efficient flow analysis tools (HexaGrid/FaSTAR), increasing usability by adding more functions, and improving operability with graphical user interface (GUI). We are endeavoring to ensure the usage of simulation results and to promote their effective applications at the design and development stage by creating tools to quantitatively evaluate numerical uncertainty, and developing guidelines whereby the separation between numerical results and real phenomena can be included within the allowable tolerance. The purpose of this study is to realize a higher efficiency of more than 10% in terms of utilization in arithmetic units, even in complex CPU, by presenting several effective usage methods (e.g. tuning policies and/or programming styles) to multi-/many-core CPU incorporating multiple structures of one CPU.